The centre stained glass window of the north aisle depicting Christ Blessing the Children (pictured above, installed in 1898) and an ornately carved oak litany desk (pictured below) at Old St Paul’s both commemorate Mrs Mary Anne Swainson (1833?-1897) . In 1878 she founded the educational establishment that is now Samuel Marsden Collegiate School for Girls. Gifted by her loving pupils after her death, both objects are testament to Mrs Swainson’s commitment to education and her strong relationship to St Paul’s church. When Mary Anne Swainson’s husband died suddenly in 1870, she was left with five children all under 10 and an estate valued under £600. Fortunately, Mrs Swainson had already begun to establish herself as a reputable headmistress at her small school for girls on the Terrace. When the school eventually grew too big for the house, she moved to 11 Fitzherbert Terrace in Thorndon in 1878. Mrs Swainson remained headmistress until her death in 1897. Usually referred to as Mrs Swainson’s school, it is well known for being the childhood school of Katherine Mansfield. It also became one of the country’s longest established private schools for girls. From the beginning, Mrs Swainson wanted to establish a strong connection with the church. This relationship ensured the success of her school for many reasons. It gave the school credibility and attracted families wanting their children to have a religious education while also justifying fees in the presence of growing free public education. 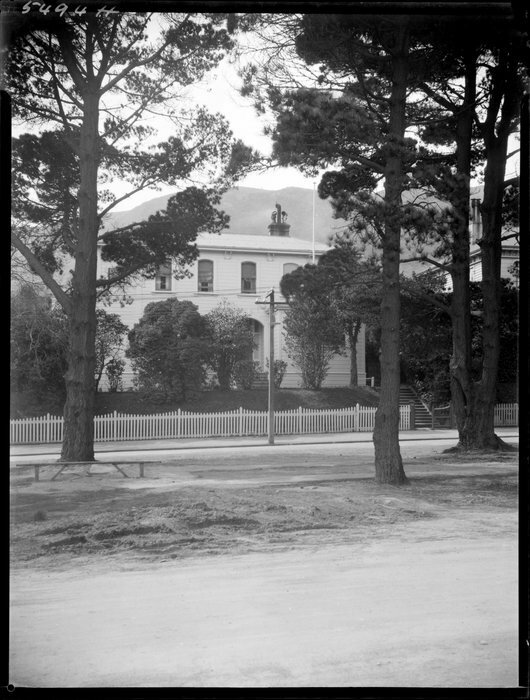 Fitzherbert Terrace School in Thorndon, 1927. The school was just a five minute walk to St Paul’s, and church attendance, instruction, preparation for confirmation and religious ceremonies were all an important part of attending Mrs Swainson’s school. The organist and choirmaster of St Paul’s, Mr Robert Parker, agreed to give music lessons to the senior girls and was a much loved teacher. Just as the church was a part of school life at Mrs Swainson’s, the school was also a part of the life of St Paul’s. When the girls set off looking smart and polished in their best frocks and hats for the Sunday service, parishioners would complain about the strong smell of boot polish coming from the group of Swainson’s boarders entering the church. St Paul’s vicar Mr Sprott, who was also chaplain for the school, would always give the girls a big slice of seed cake when they delivered him messages. Mrs Swainson’s daughter, later headmistress of the school, also gave her time to help Mr Parker and trained the choir of St Paul’s. Mrs Swainson’s school was later sold to the Diocese of Wellington in 1920 and renamed the Samuel Marsden Collegiate School in memory of New Zealand’s first missionary. Although the school moved to Karori, pupils both young and old have returned to Old St Paul’s to celebrate the work of Mrs Mary Anne Swainson and the bond formed between her school and the church. The litany desk given in Mrs Swainson’s memory by her pupils. The window in her memory, installed a year after her death, was the gift from her loving pupils and was executed by Lavers and Westlake of London. 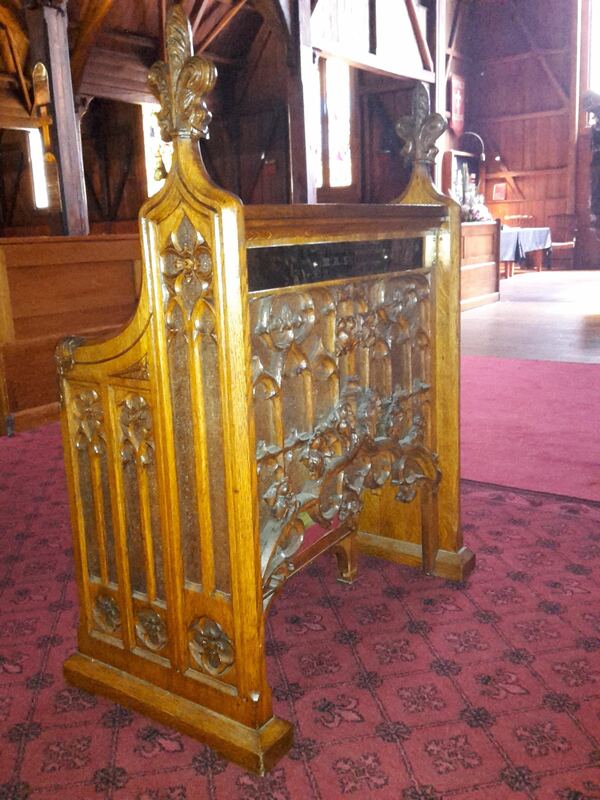 The litany desk was made by Harriette Crawford, see here for the story. URL: http://www.TeAra.govt.nz/en/biographies/2s55/swainson-mary-anne; Kirsty Carpenter, Marsden Women and their World: A history of Marsden School 1878-2003. Wellington, 2003; Murray, Tosti. Marsden: The history of a New Zealand School for Girls. Christchurch, 1967.